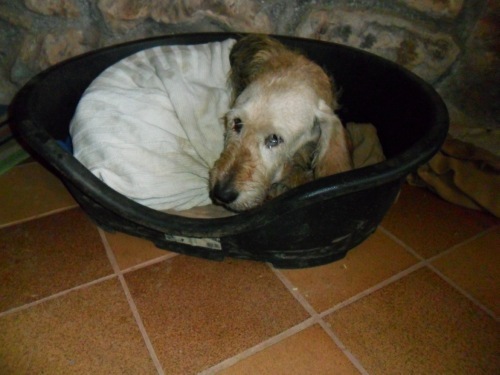 At the beginning of this month, a new young dog arrived at the perrera (dog’s home) and Marleen was asked to take care of her. First, she had to be sterilized, but on Tuesday we went to collect her from the vet clinic. She looked so sad with this big plastic thing around her neck, so that night she decided to take it off herself and we kept it off as long she wasn’t licking her wound. After a few days of rest, she needed to get a suitable name and Marleen came up with Loba, which means female wolf in Spanish. Everybody agreed that this name was perfect for the little girl. In the beginning she was very restless in the house, but after a few days she settled in just fine. Now almost a month later, she’s as good as housetrained (except for a little accident now and then) and she really loves to learn and get 1 to 1 attention. She also likes to play with the other dogs, but she doesn’t know what to do with cats yet. Big animals like donkey’s and horses are a bit scary for her, but she’s learning to get on with them as well. For someone who has a lot of time to spare to work and train with her, she will be a fantastic dog to have around. 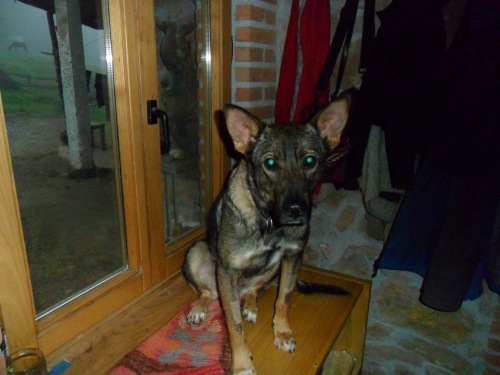 Whilst Loba was learning new things, another dog arrived at the perrera. It was an old hunting dog that had a chip and officially needed to go back to her owners. Everybody who saw her decided that whatever happens, this dog is not going back to her owners. 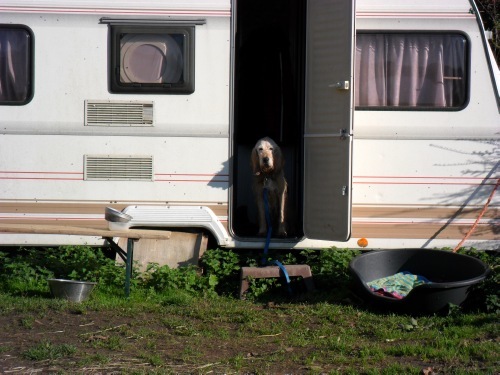 Marleen wanted to take care of her and rang the owner to ask if she could have the dog. The owner agreed immediately and so the next day the hunting dog was brought to the paradise. We decided that she was going to be called Deva (after an Indian goddess). Bob brought her here and she looked horrible!!! She was absolutely emaciated, her eyes were infected and her coat felt like rope with grease. We gave her a basket and put a blanket on top of her because she was shaking from cold; she fell a sleep and slept all day! The first 3 days we just left her alone to adjust and only gave her food and water and took her for little walks. The rest of the time she was sleeping a lot. When she was getting a bit more active, I decided to give her a good brush and clean her eyes a bit. You could really see the difference after I was finished. Her coat looked so much shinier and you could tell that she felt better as well. 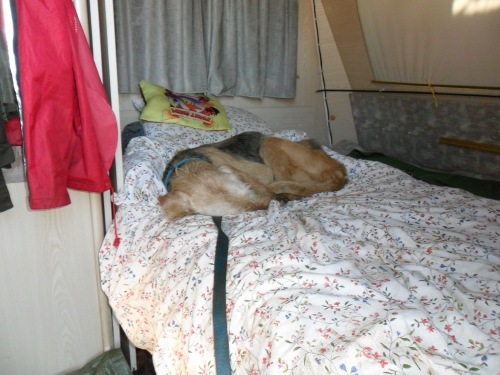 Since that day I brushed her every day and after a week I took her into my caravan where she still lives these days. The sad thing is that we had to take her to the vet, because we felt a lump on her belly and it turned out to be cancer. So we decided to make her life as comfortable as possible for the time that she has left. That means that she goes out for longer walks, gets 4 meals a day and sleeps on the bed whenever she likes! It has only been 3 weeks since she’s here, but she is a completely different dog. She is much more active, came on a little weight, responds to her name, tells me when she need to pee or pooh at night and she just looks very content. So as you can read, it`s not only a donkey paradise, it`s a doggy paradise as well!